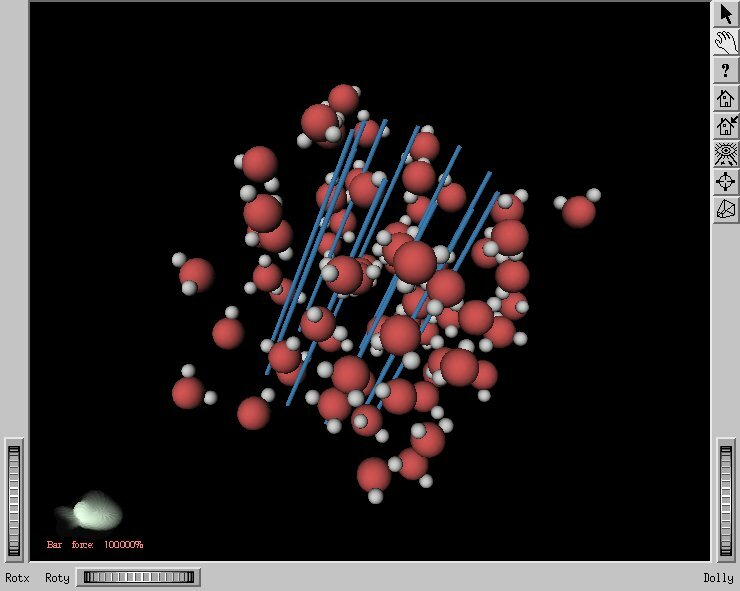 This project simulates water molecules whose random motion is partially constrained in one direction. Molecules are treated as points that have a certain potential that governs their motion. The directional constraint is established by parallel lines with a Lennard-Jones potential. Dr. K. Smith - Furnished the topic of this research project, a working simulation to start from, and invaluable help in understanding the code involved. Dr. D. Banks - Described project and goals, provided guidance and assistance through development. 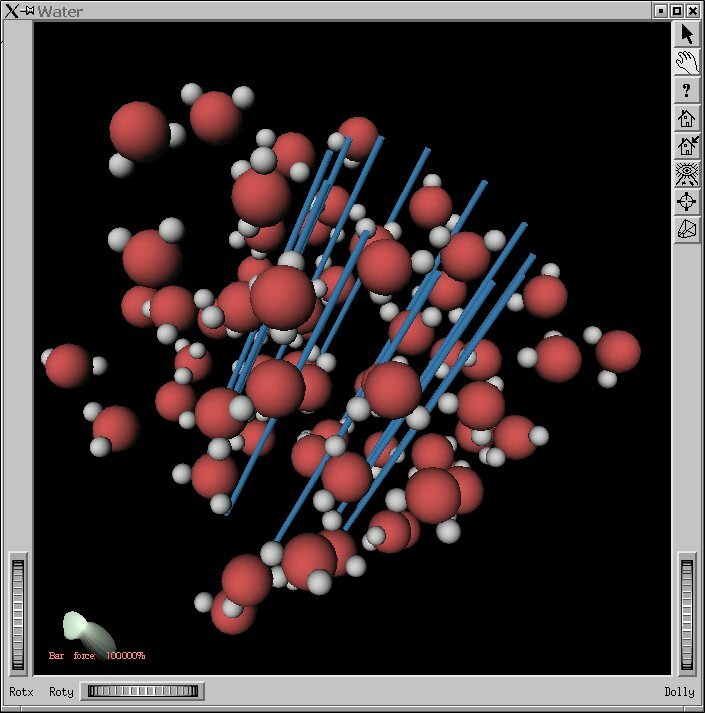 The simulation uses the "moldy" molecular dynamics simulation written by Keith Refson, and modified by Dr. Smith. 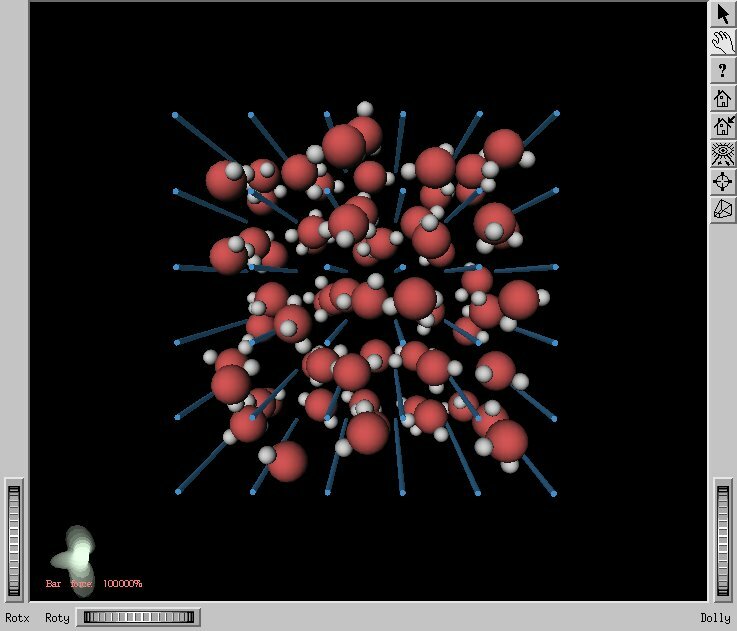 This program was modified to be fitted with an Open Inventor view of the simulation by Dr. K. Smith. 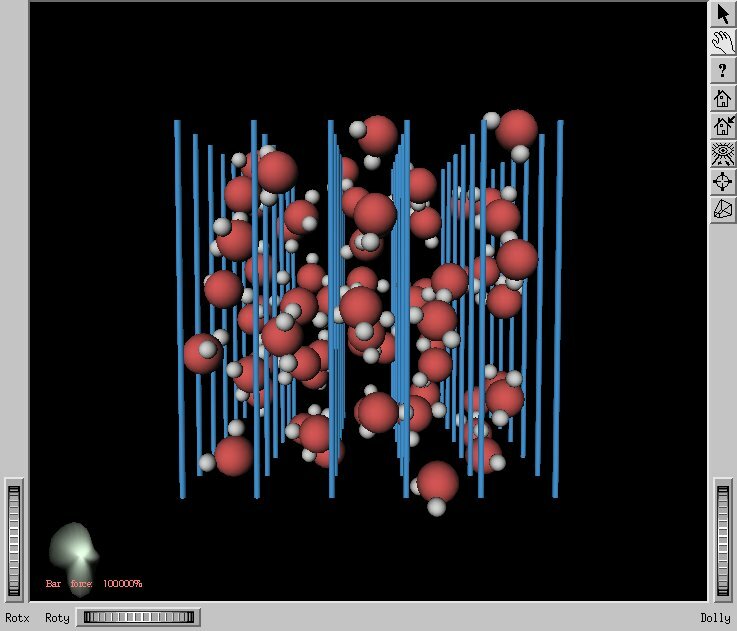 She provided me with a simulation of the molecules diffusing un-impeded. 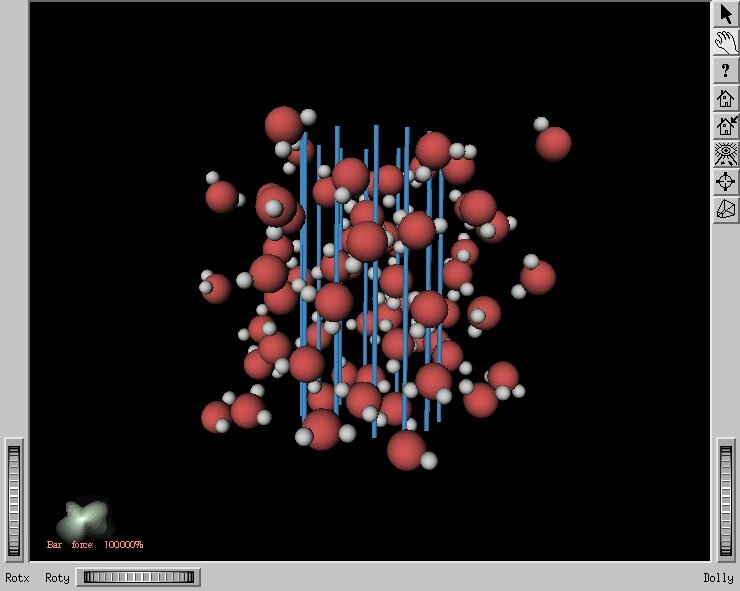 It was my task to take the simulation further, adding surface "tissue" to interact with the molecules. 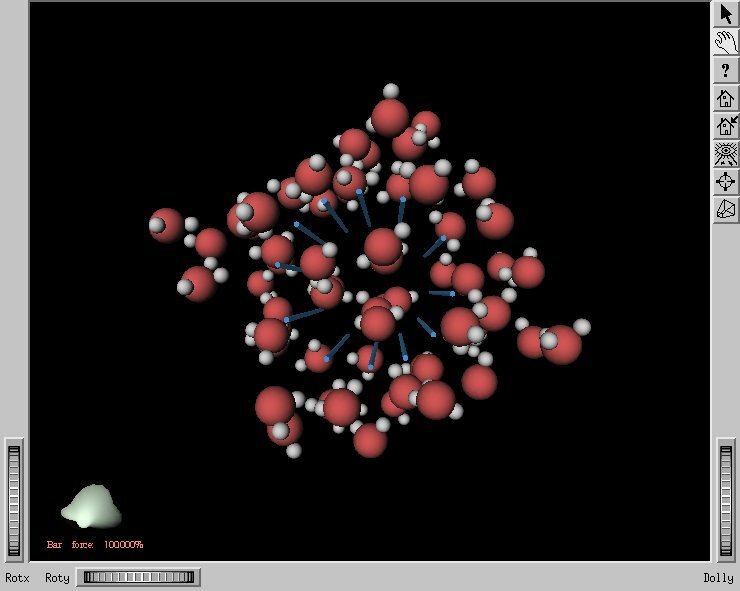 Modified Inventor viewer to allow for arbritrary number of water molecules. Added function to read in description of lines from a file. Each line has a postion, direction, and repulsion factor. Inventor viewer displays the lines. 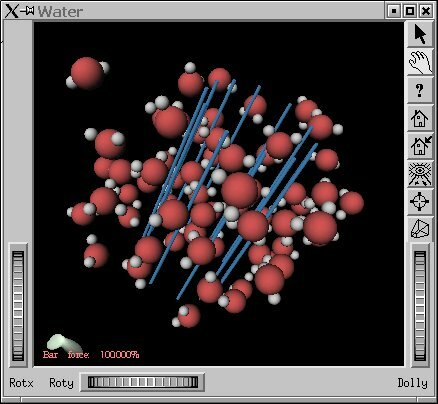 The lines repel the water molecules. Since the state begins far from equilibrium, the repulsive force of the bars is slowly scaled up to 100% in order to prevent excessive velocities. There is a readout of the scale in the bottom left-hand corner. 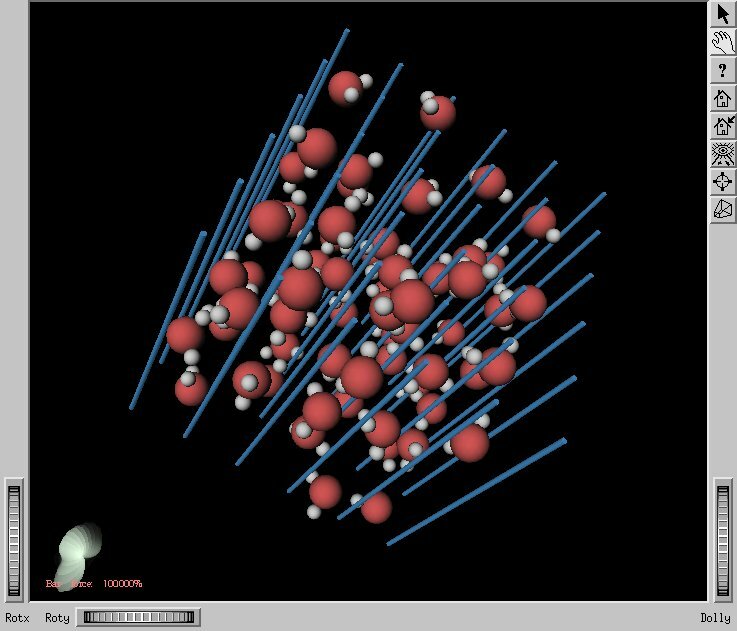 Added glyph representing global molecular velocity. Each molecule's velocity contributes a bump to the glyph. Large protrusions on the glyph indicate a large number of molecules moving in that direction. This glyph is always viewable in the lower left-hand corner of the screen, and may be viewed larger by zooming out on the viewer (yes, out). I would like to work on these things. Fix camera-alignment of glyph in lower left. Right now it rotates with the camera, but in the wrong directions. Study and debug the glyph. Is it correct? The results are surprising so I wonder. The shots below show the program running with two different line configurations. See the top views to see the layout of the lines.